I will start adding Valentines Items soon please let me know if there is something you don't see that you would like. Christmas orders please place now. Please contact me for all orders with Korkers in them at this point to see if I have enough time to make them and get them to you in time for Christmas. Last day for placing orders with just hair bows NO korkers is December 14th. Subject to change as orders come in. I will be closed for processing of orders from December 14th - January 1st of 2012. Depending on how many orders are coming in. I will leave the shop open just not process them till after the new year. I will not guarentee delivery of order before Christmas unless you pay for priority or express. I checked the USPS website and they are not saying there is a delay in shipping times but I am seeing that First Class is taking longer. I would say you can take the chance or pay to upgrade to one of the menitoned above to quarentee delivery. I have hairbows in sizes from 2.0" to Jumbo of 5" or I can custom make a size for you. Hair bows,korker bows,clippies,headbands,flowers and even barrettes for women. They are all made by me Lori a mother with a little girl of her own. 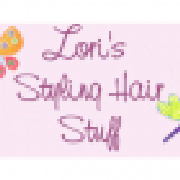 Thank you for visiting Lori's Styling Hair Stuff on Zibbet, and if you have any questions or would like a custom order please contact me. Remember most items can be placed on a alligator clip(with or without grippy),french clip(barrette),pony O,pin backing/brooch,magnet or even a shoe clip if you would like. All items are made after purchase unless listing states this is a premade item. Depending on item and size of order I usally make them the same day or next and ship them out immediately.